A World Series rematch between the Mets and Royals highlights Major League Baseball's opening day schedule on Sunday, April 3. The defending league champions will play in Kansas City at 8:30 p.m. ET on ESPN's Sunday Night Baseball. The Pirates and Cardinals get things started earlier in the day, with first pitch scheduled for 1 p.m ET at Busch Stadium. The Rays will then play the Blue Jays at 4:05 p.m. ET at the Rodgers Centre. 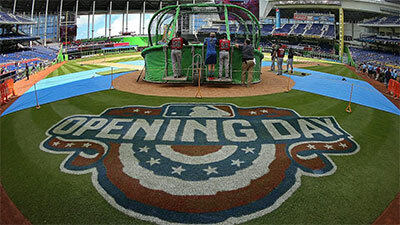 Twenty-six remaining teams will open the season on April 4, while the Tigers and Marlins will start on April 5.